The Special Thessaloniki District Attorney for Cases of Corruption (ThDAC) has ordered an immediate inquiry concerning public works paid by the Greek State (25%) and the EU Cohesion Fund (75%). 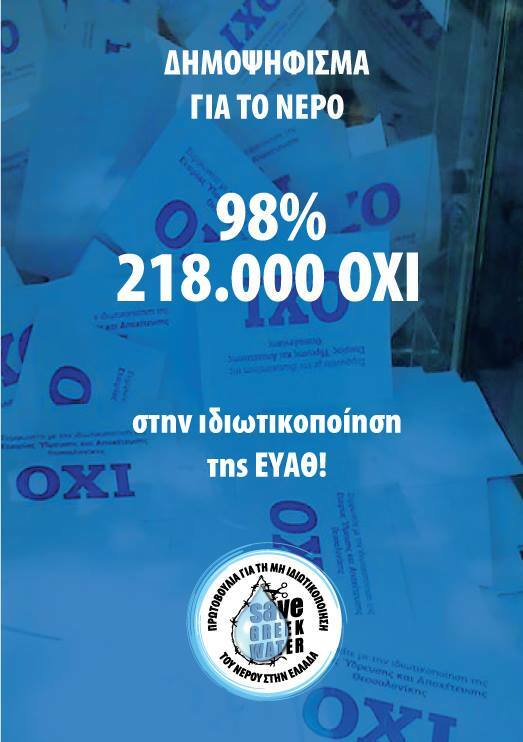 As per a report of (Greek newspaper) ELEFTHEROTYPIA these will be given as a present (for free) to the private institution(s) that will acquire the EYATh (Thessaloniki Water Company) shares. As per the newspaper report several water and sewerage infrastructure works, the cost of which amounts to more than € 100 million and is to be borne jointly and exclusively by the Greek State and the EU Cohesion Fund, are to be constructed under the supervision of the Special Authority for Public Works (SAPW) of the Greek Environment and Growth Ministry. The construction of the above will continue in the same way into 2016 (and maybe beyond) that is even after EYATh’s transfer to private ownership. As per the Greek Government’s promises such transfer will be concluded by March 2014. Special District Attorney Argyris Dimopoulos ordered TAIPED (the Fund commissioned with selling out the Greek State’s private property) to submit the Contract by which the EYATh shares are to be transferred; this 250 page contract has already been asked to be examined by the Greek Parliament but TAIPED has not complied up to now. Of special importance are the provisions included therein concerning the use of the already mentioned public works. Are Greece’s European Partners aware that the money they have deposited in the EU Cohesion Fund will be used by the Greek Government to subsidize private entrepreneurs? The modernization of the computer systems of EYATh will cost some € 2 million and will be paid by the Greek taxpayers despite the fact that the company will soon be transferred to private ownership. It was inevitable that such a procedure would draw the attention of the District Attorney and is already under examination. But this case is dwarfed by a more recent procedure according to which the Greek Government will use more than € 100 million of taxpayers’ money and funds of the EU Cohesion Fund to construct or modernize Water Supply and Sewerage Infrastructures on behalf of EYATh; the new (private) owners of the company will benefit from such without having paid a single cent towards their cost. Today, only a few hours after celebrating Greece’s entry in the EU Presidency, one can only wonder whether all those who attended the party in Athens, and even more importantly the taxpayers in the rest of EU, are aware that their money is given for free to private prospectors. Not only did the Greek Government undertake to proceed with the construction of such infrastructures it also agreed to continue paying for these even after the transfer of the majority of the EYATh shares (and of course its management) to private prospectors. The price to be paid by the future private owners of EYATh is some € 110 million, i.e. only a small fraction larger than the sums already mentioned. By paying this the new owners will get for free the use of such infrastructures which, among others, include upgrades in the Thessaloniki Biological Treatment Plant, already run by Joint Venture SUEZ-AKTOR (the future owners of EYATH) or other installations run by Castor SA (a subsidiary of AKTOR). All facts above have already been made public through the webpage of SAPW. SAPW has already prepared the blueprints and issued an invitation to a public tender for such works. The contractor will be paid by SAPW using money given by the Greek State and subsidies of the EU Cohesion Fund. Such a procedure was normal in the past when EYATh was a public institution and even when the Greek State owned the majority of its shares. Now when EYATh is being turned over to the private such a procedure cannot be deemed acceptable. € 4,9 million are to be used for building and connection projects in the Biological Treatment Plant (run by castor SA, as has already been mentioned), another € 44 million will be used for the construction of a second branch to the main sewers lineage line, € 17,7 million has been used for building a Thermal Drying Sewage Treatment Unit, while the tender for the Building of an Extension to the Water Treatment Unit (€ 36,5 million) is still pending. All the above will be to the benefit of the prospected private owners of EYATh. The Greek Government seems to be in a hurry to proceed with the transfer as soon as possible despite the fact that a Council of State Decision (issued on an Appeal against such transaction) orders the discontinuation of the procedure (the Decision has not been formally published yet). One wonders whether the EU and the EU Cohesion Fund are willing to press the Greek Government towards stopping to subsidize private companies, especially as Greece (i.e. its taxpayers) have been penalized in the past for similar acts of its governments.